In the 60s, the car air conditioner was considered a luxury. So, at that time only about 20% of cars in the USA had it. However, in the late 20th century, the manufacturers widely started offering the car A/C. Today, almost every car has it. The car A/C works in two cycles: Refrigeration and Evaporative Cooling (evaporation and condensation). The main purpose of the car air conditioner is to make the cabin ambiance comfortable for the occupants. Firstly, Air Conditioning is the process of making the air comfortable for the car’s occupants. The engineers achieve this by making changes in air’s properties. This mainly includes its temperature and humidity. An air conditioner is a device which changes and controls the properties of air. Basically, it improves the air quality and its thermal condition. A car air conditioner also does the same. 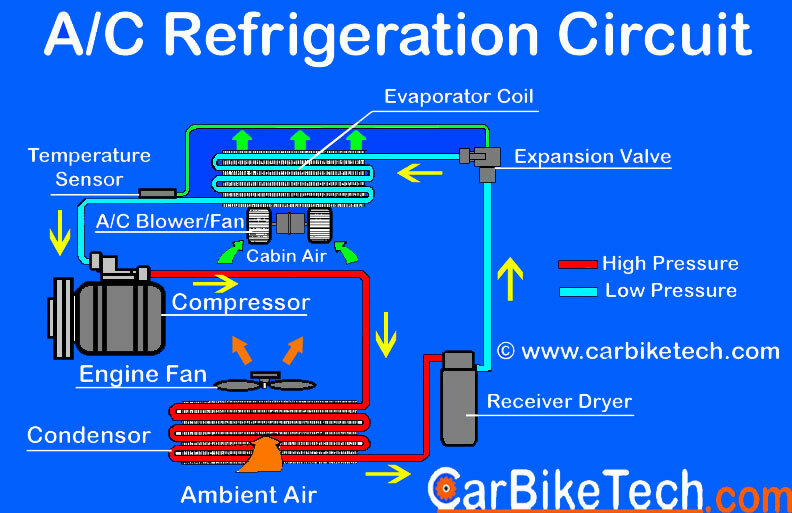 Now, let’s understand the working of the Refrigeration Cycle employed in modern-day car A/Cs. The car Air Conditioning system circulates the refrigerant under pressure through these five major components in a closed circuit. At these points in the system, the refrigerant undergoes preset pressure and temperature changes. Basically, the Car Air Conditioner has two different circuits. One is for circulating the A/C refrigerant (cooling gas) while the other is for circulating the cabin air. The refrigeration gas circulates within the closed Refrigeration Circuit. It enters the compressor which compresses it further. This increases both its temperature & pressure. The compressor draws the low-pressure refrigerant gas through the suction valve (low side). It then pressurizes the hot refrigerant and increases its pressure. The compressor then forces it through the discharge valve (high side) into the condenser. 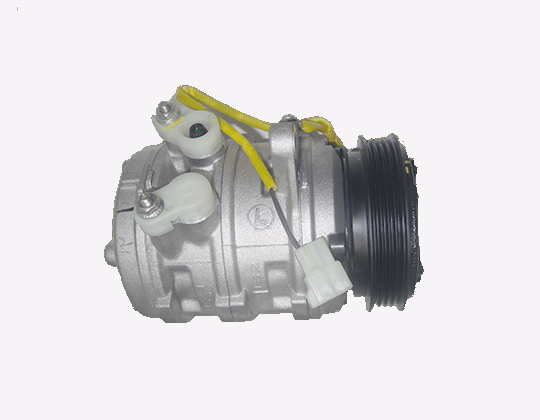 The A/C compressor uses a magnetic clutch to connect and disconnect the compressor from the engine. The compressor then pushes the compressed gas to the condenser unit. The condenser is located at the front of the vehicle. It sits behind the front grill and in front of the car’s radiator; facing the wind. Ambient air passing through the condenser removes the heat from the circulating refrigerant. Thus, the refrigerant converts from gas to liquid. The condenser unit looks and works very similar to the engine radiator. It absorbs the heat from the hot refrigerant. Then, it converts the high-pressure gas into the high-pressure liquid refrigerant. The liquid refrigerant moves onto the Receiver Drier. It also contains a filter and a desiccant. 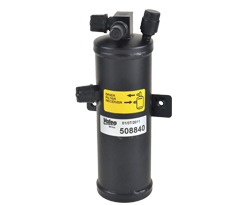 Receiver Drier filters out the impurities and removes the moisture from the refrigerant. It also serves as a temporary storage tank for the liquid refrigerant. The high-pressure liquid refrigerant then flows to the expansion valve. As the refrigerant passes through the valve it becomes low temperature, low-pressure liquid, and vapor. 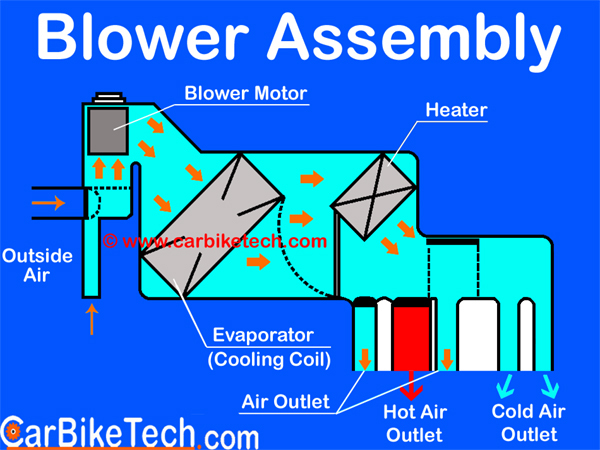 The expansion valve sprays the refrigerant into the evaporator in the mist form. This valve controls the amount of refrigerant entering the evaporator. The low-pressure liquid immediately starts to boil and vaporizes as it enters the evaporator. A temperature sensor at the evaporator outlet controls the expansion valve. (If the outlet temperature is too high, it indicates that sufficient refrigerant is not reaching the evaporator. This will result in poor cooling of the cabin). The temperature sensor sends the signal to open/close the expansion valve. This is to achieve the correct flow of the refrigerant. 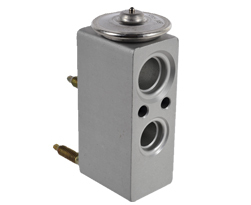 It enables the A/C to attain the rate and temperature of the evaporator outlet. The foggy mist of the refrigerant, then, enters the evaporator. On the other hand, the car occupants emit the heat which mixes with the cabin air. This warm air then enters the evaporator as the blower pushes it from the bottom side. The cabin air passing over the evaporator fins gives up its heat to evaporating refrigerant. Since the refrigerant is colder than the air, it absorbs the heat from the air. This produces cool air which is then pushed into the cab interior. The ideal cabin air temperature for humans is around 23 degrees Celsius. Most automatic air conditioners try to achieve this by automatically shutting off/on the a/c compressor and recirculating the cabin air effectively. The moisture in the air condenses upon entering the evaporator. It drops into the drain pan from which it is then drained out of the cabin. 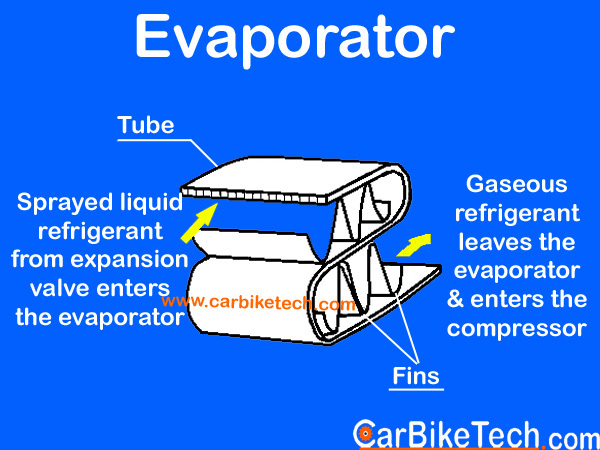 Evaporator removes humidity from the air and makes it dry. It passes the cooled air back into the cabin thru' the A/C vents provided in the dashboard. Then, the temperature and pressure of the refrigerant drops. It becomes low pressure & low-temperature gas. This low pressure and low-temperature gases again enter the compressor thru' the suction side and this cycle repeats. Besides, the car air conditioner also has the ‘Recirculation’ and ‘Fresh Air’ modes. Ideally, you should keep this setting in the ‘Recirculation’ mode. After prolonged use, the air inside the passenger cabin becomes humid and impure. Then, you should turn the ‘Fresh Air In’ mode on. This lets the outside fresh air to enter the cabin and replaces the warm/humid air. Thus, A/C makes the cabin air fresh again. In order to ensure efficient cooling and reduce the air drag, it is best to roll up the windows when the A/c is in operation. With windows open, the air conditioner still cools the cabin; but slowly. Most car air conditioners are capable of making the air upto 10 to 15 degrees cooler than the ambient air. 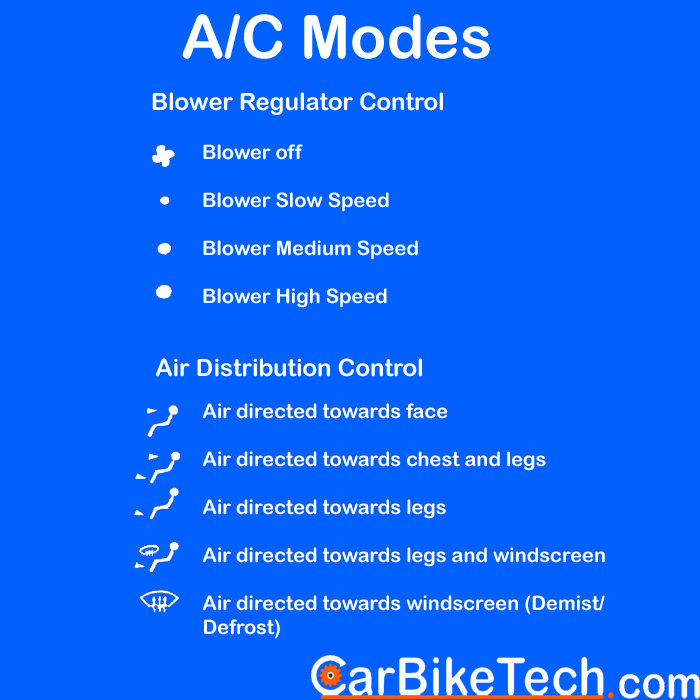 However, the modern air conditioning system consumes the engine power significantly. This could be up to 4-5 Bhp of the engine’s power. Hence, using the Air Conditioner also affects the vehicle’s fuel efficiency. It can reduce the car’s mileage by 1-2 Km/L. Behr and Subros, Valeo, Keihin, Sanden, Aotecar are some of the leading car air conditioner manufacturers for vehicles in the world. The refrigerant is a mixture of liquid that the Refrigeration Cycle uses. It undergoes the transformation phase from liquid to gas and back. The refrigerant is the fluid that is used in the car’s air conditioning system. 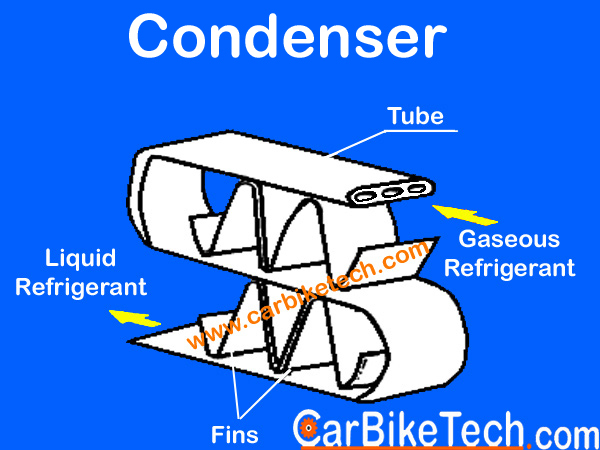 The refrigerant transfers the heat as it changes from the liquid state to gas state. The scientists found that the Freon-R12 gas is the most damaging to the ozone layer. So, modern cars use R134a refrigerant which is environmentally friendly. The emission from the car air conditioners is the growing concern because of its impact on the climate change. Home » Technical Anatomy » How A Car Air Conditioner OR Car A/C Works?